With the failure of traditional Islamic movements, the Wahhabism as a pivot now dominates the global panorama. It is today regarded as the epicenter of all kind of Islamic revolutions in various mutated forms by most of the Muslims, due to its teachings regarding state and religion. According to this particular school of thought, the Ulema are responsible for the protection of the divine law and one can accept the rule of anyone who follows Sharia. Based on the principle of pure monotheistic worship, this movement also advocated purging of practices such as popularizing cults of saints, and shrine visitation, widespread among Muslims since the spread of Sufi Islam. The movement considered these as impurities and innovations in Islam, an extreme form of which they believe may lead the believers to shirk (by practicing idolatry or polytheism). Such attempts to project a puritan form of Islam bereft of impurities and innovations have further benefited from the seed itself which has been sowed couple of centuries ago and have been influenced by the rapidly transforming geopolitical scenarios in the modern era, resulting in Wahhabism becoming more open and inclusive – by targeting not just Sunni Muslims, but also non-Sunnis and non-Muslims in their preaching – and thereby attracting more audiences. Additionally, the spread of education and advancements in communication systems have made it easier to transmit Wahhabi doctrines to different segments of Muslim populations across the globe. Though it sounds prophetic but is it really so? Is the movement really becoming more open and inclusive? Do the preachers really practice what has already been preached? The doctrines being transmitted are just the sacred doctrine or dissemination of some extremist expositions? Last but not the least, are these audiences joining voluntarily or there is a forced submission to the ideology? All these finds an answer in today’s West Asia. Wahhabism as an ideology is largely responsible for the situation in the West Asia today; a situation that does not just effect the West Asia, but as we have seen more and more since 9/11, effects the US, Europe, the West and probably the entire world. It is responsible for decades of violence, war, suffering and manipulation. The origin of which can be traced back to an approximate era – roughly 100 years ago, during the events occurred under illogical Sykes-Picot agreement made at the time of First World War. The modern roots of Wahhabism can be traced to Najd in Saudi Arabia and the 18th century theologian Muhammad ibn Abd al-Wahhab. The main tenant of his doctrine was the key idea of takfir, where one Muslim declares a non-Muslim or an apostate, an unbeliever or Kafir (Infidel). According to ibn Abd al-Wahhab and his followers, any Muslim who honored the dead, saints, or angels, believed in pilgrimages to tombs and special mosques, religious festivals celebrating saint’s birthday, the honoring of the Muslim Prophet Muhammad's birthday, and even uses gravestones when burying the dead are infidels. He held that such sentiments detracted from the complete subservience one must feel towards God, and only God, thus these must be banned. Abd al-Wahhab denounced all such infidels. “Those who would not conform to this view should be killed, their wives and daughters violated, and their possessions confiscated, he wrote”. Far from being regarded as a legitimate interpreter of Islam, al-Wahhab was opposed even by his own father and brother for his beliefs. But the movement gained unchallenged precedence in most of the Arabian Peninsula through an alliance between Muhammad ibn Abd al-Wahhab and the House of Muhammad ibn Saud, which provided political and financial power for al-Wahhab’s ideologies to gain prominence. Marriage between Muhammad bin Saud’s son, Abdul-Aziz bin Muhammad, and the daughter of ibn Abd al-Wahhab, helped to seal the pact between their families which has lasted through the centuries to present day. This alliance gave birth to the Kingdom of Saudi Arabia; following the collapse of the (Turkish) Ottoman Empire after the First World War, the House of Sauds seized the control of the Hejaz and the Arabian Peninsula and a nation was founded on the tenets of al-Wahhab – the state-sponsored, dominant form of Islam in the very cradle of Islam. The duo could now do what they always did, which was raiding neighboring villages and robbing them of their possessions, this time not under so called Arab tradition rather under their legitimate banner of jihad. ibn Saud and Abd al-Wahhab also reintroduced the idea of martyrdom in the name of jihad, as it granted those martyred immediate entry into paradise. Their strategy was to simply instill fear and bring the people who they conquered into submission. Does the strategy look any different from that of ISIS? The question that needs an answer is does the strategy look any different from that of ISIS? The answer is a simple ‘NO’. Be it the humanitarian crisis in Syria, the ISIS taking over of it and Iraq by the fall of 2013, Israeli offensives in Gaza, the rhetoric “Britain Belongs to Allah” by the likes of Anjem Choudary and his supporters in Britain, the Charlie Hebdo attacks in France, the taking over of the Qalamoun mountains in Syria or the very recent plight of the Alawite minority of Tartus, second largest port city of Syria, all of it testimonies the fact loud and clear. 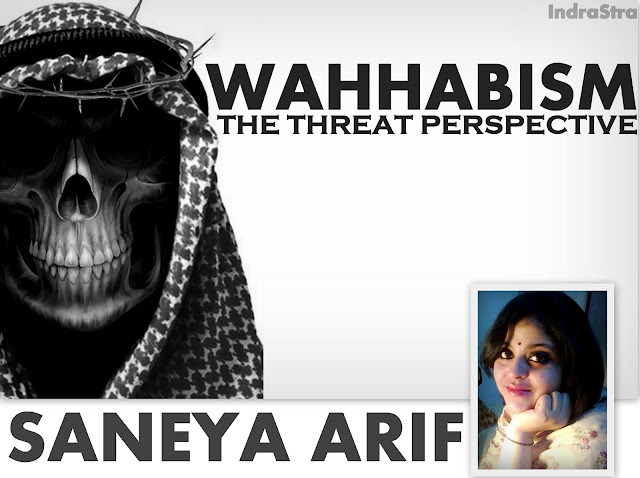 The Wahhabi doctrines have been a major influence on Extremism, Islamism and Terrorism. According to an article titled “ZIONISM and WAHHABISM: The Twin Cancers Destroying the Middle East (and their Dark Origins)” by the Burning Blogger of Bedlam, dated 7th November 2014, “The ideologies have been methodically disseminated across the Islamic world for a hundred years via Saudi oil based wealth funded ‘education’ through religious literature to universities and mosques everywhere from Egypt - Iraq to Pakistan - Indonesia. Worse scenario is the Saudi-funded dissemination of Wahhabi-inspired propaganda has for a long time been spreading beyond the Middle East and into the Western societies, especially the Muslim communities in the UK. A recent two-year study conducted by Dr Denis MacEoin, an Islamic studies expert who taught at the University of Fez, uncovered a hoard of “malignant literature” inside as many as a quarter of Britain’s mosques. All of it had been published and distributed by agencies linked to the government of King Abdullah of Saudi Arabia”. “The leaflets, DVDs and journals were full of statements that homosexuals should be burnt, stoned or thrown from mountains or tall buildings, with adulterers and apostates (those who try to change their religion) proscribed a similar fate. Women were portrayed as intellectually inferior and in need of “beating when they transgressed” orthodox Islamic codes, while children over the age of 10 should be beaten if they did not pray. Half of the literature was written in English, suggesting it was targeted at younger British Muslims who don’t speak Arabic or Urdu. The material, openly available in many of the mosques, advises British Muslims to segregate themselves from non-Muslims”. Are these extremist literature, DVDs, YouTube videos and Journals attracting European foreign fighters to join the war of so called Jihad? There has been a plenty of news reports of such joining on internet. These foreign fighters (FFs) have made numerous headlines, with pictures of them posing with heavy weaponry. The instance in October 2014 that reported about death of a Norwegian Kurd in his twenties, or the rhetoric, “Britain belongs to Allah” by radical preacher Anjem Choudhary in UK, speaks all about it. Thus, these do have served as a tool for an effective recruitment in the past. Saudi-funded Wahhabist literature can be cited as a major influence (though not the sole influence) on the radicalization of young British men and joining extremist organisations like Al-Qaeda and ISIS. In places like Pakistan where, unlike in the UK, most young men do not have the privilege to pursue higher education have access to religious schools and mosques, many of which teach from such funding. Doesn’t the brutality of Islamic state yet instill fear in Saudis that it may pose a threat on them too? It seems that the opinion still stands divided in the country. Some believe that it is just a Shia Sunni schism, while others do foresee the adverse consequences that are imminent in the long run. They are more fearful, and recall the history of the revolt against Abd-al Aziz by the Wahhabist Ikhwan. A 17 minute audio message launched in November 2014, purportedly from its elusive leader Abu Bakr al-Baghdadi, sets its sights firmly on Saudi Arabia. The speaker did not refer to it as Saudi Arabia, since this is a name derived from the ruling tribe, the al-Saud whose authority IS does not accept. Instead he called it “the land of Haramayn”, that is the land of the two holy places, Mecca and Medina. Reaching out to IS’s growing number of Saudi followers, he sets out a target list for attack, starting with Shiites who make up a minority in the oil-rich eastern province and whom they view as heretics. Another video released by IS this January intended to invade Saudi Arabia while the kingdom’s throne changed hands. These threats posed to Saudi Arabia rattled the natives for a certain period of time (evident by the beefing up of security mechanisms along the borders), however very soon statement made by the U.S. military stating Islamic State's threat in the country to insignificant one which eventually comforted them. In conclusion, it is beyond the power of any country to comment decisively on whether the IS will pose future threat to that particular country or not, Saudi being a fund provider to extremist literature, must be alert too viewing the past threats from an extremist organization. Wahhabism as one of the most destructive, toxic ideology have played well in creating the harsh, apocalyptic-looking conditions we have in the West Asia and much of the world beyond today. The need of the hour is to put a short stop to this cancerous tumor before it reaches its last stage. One must come out of the camouflage of the so called Jihad and think; if Prophet would have been alive would he be happy seeing all this? Thus, is it appropriate for followers of the Prophet to say goodbye to sentiments of mutual understanding, tolerance and perseverance and go out, armed with dangerous weapons, to annihilate innocents and sow the seeds of hatred? No sane human being will say yes to it. Today, a collective military action seems to be the only way to check such menace, but a lasting peace in the Islamic world is possible only if a battle is waged within Islam to change the mindset. Besides we need to look beyond the usual Islamophobic and Islamophilic perspectives. Last but not the least Saudi Arabia needs to take this seriously and act effectively on it. Next time whenever the likes of Afghanistan and Iraq are subjected to invasion, likes of Syria and Libya encounters an overthrow of their governments then likes of Saudi Arabia must also be questioned over the cynical and methodical dissemination of extremist doctrines across the Muslim world. Only then a time will come when there will be no one pulling the knots from each side of the rope and peace will prevail thereafter.